Dirk, at Wilson Peak’s summit. Left to right, Gladstone, Mount Wilson, and El Diente can be seen. So far so good, we climbed and skied El Diente and Mount Wilson the day before, and with another clear and cold night we were able to shoot for two more summits the next day. One of them, Wilson Peak, might not be skiable off the summit from the side we were approaching from. The other, Gladstone Peak, is a high 13,000 ft. peak between the two Wilson summits. Gladstone had been on my list for some time. 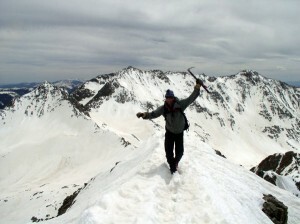 At 13,913 ft., it is on the list of 100 highest summits in Colorado, a.k.a “Centennial” peaks. Having completed the 14ers in 2001, I was naturally looking for the next challenge. 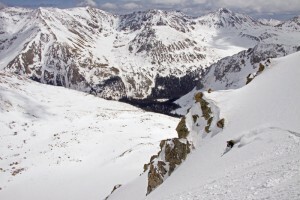 The Centennial Peaks list is a perfect post-14er finishing goal. 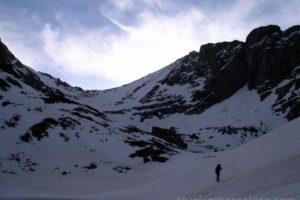 Comprised of the next forty seven highest peaks after the 14ers, many Centennials are difficult technically, more remote, and with little or no established trails. Some consider them to be more challenging than their 14,000 foot big brothers (I finished the Centennials in 2006). Although I regret it now, we left the skis at camp before heading for Gladstone. Dirk and I gained the Wilson Peak/Gladstone ridge, crossed onto the lower angled east side and traversed to the summit headwall. After some steep steps and some mixed moves we were on top— and with an awesome view of yesterdays ski tracks. Temperatures were warm and we quickly got back to camp, broke it down, and headed back over the Rock of Ages saddle to try Wilson Peak’s Northwest Face. Getting over the Rock of Ages saddle in this direction is much easier. 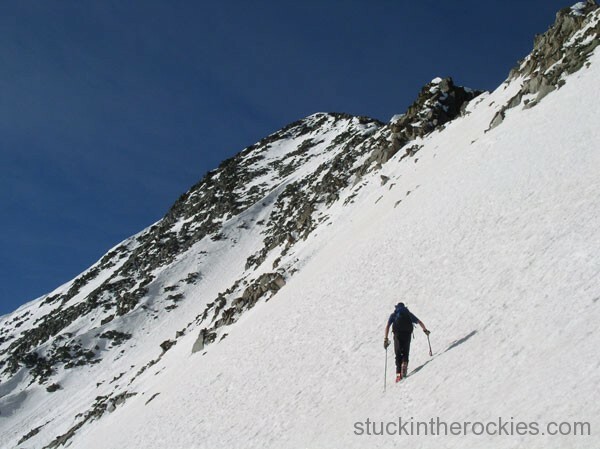 We descended and traversed to the base of Wilson Peak’s broad NW snow face, stashed our camping gear to lighten our packs, and began skinning. Eventually the face steepened and became a couloir, by then we were in crampons. 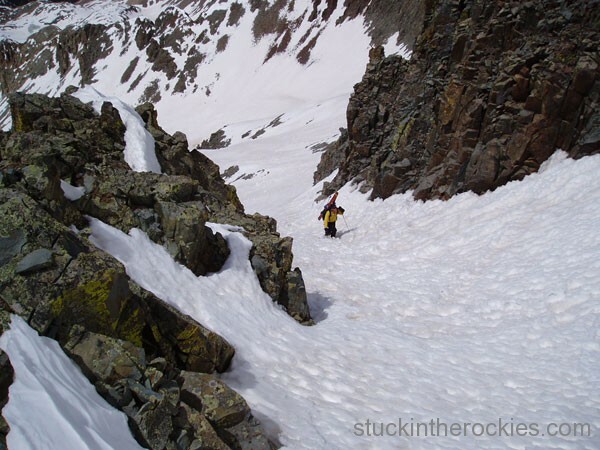 Unfortunately we ran out of snow where the couloir meets the ridge, along the usual summer climb route. The snow would continue nearer the top, but this stretch would prove impossible to navigate on skis, so we left them behind. We scrambled on some rock, about 100 feet or so, and then walked the easy ridge north to the summit. 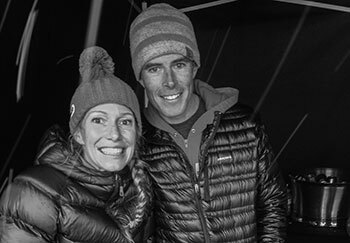 What a trip— four summits in two days, we were psyched. After an easy descent to the skis we were on our way back to the car and ultimately Telluride, where we met some friends and managed to carry our momentum late into the night. 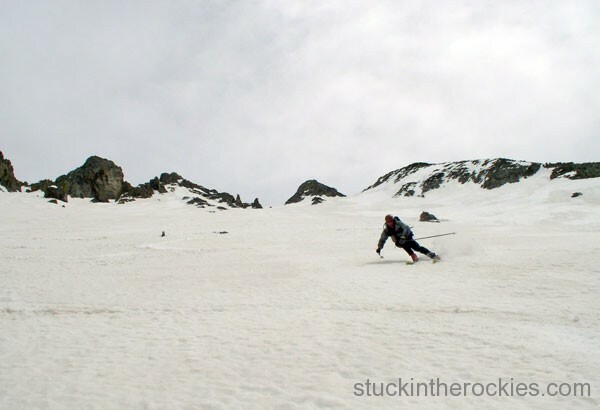 This is a prime example of a near-summit ski that doesn’t qualify under the summit ski definition. There is another, more committing route on the NE side of the mountain, that is in condition regularly. While we were only 200 vertical feet shy of the summit when we put our skis on, you need to ski continuously from the top. Dirk and I returned with Christy in 2007 to get it done right. 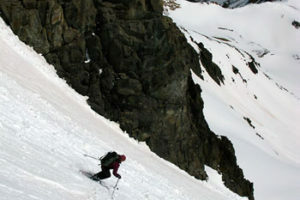 Dirk on his way to Gladstone’s steeper pitches. Ted in the couloir on the northwest side of Wilson Peak. Dirk, at Wilson Peak’s summit. Gladstone, Mount Wilson, and El Diente can be seen, left to right. 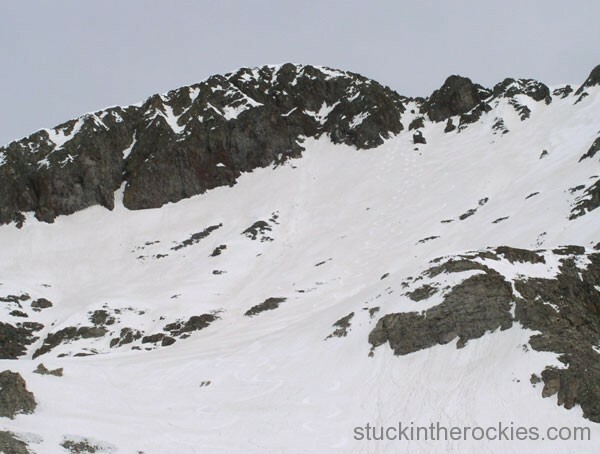 Faint tracks can be seen coming down the couloir to the right of the summit.